In this positional breakdown, I’m looking at two tight ends at the top of the individual Pro Models that Jonathan Bales, Peter Jennings (CSURAM88), Adam Levitan, Sean Koerner, Chris Raybon, Kevin McClelland (SportsGeek) and I have constructed. 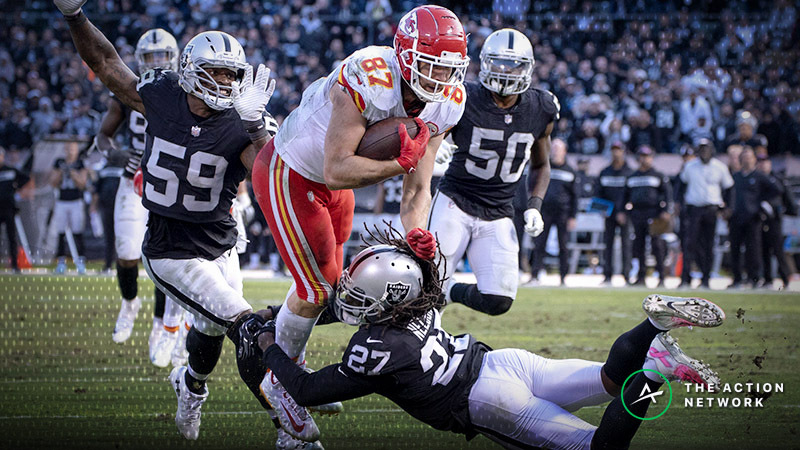 On the Week 17 edition of The Action Network NFL Podcast, we talked about the Chiefs as a team to stack and Kelce in particular as a player to roster. There are a lot of reasons to like Kelce. 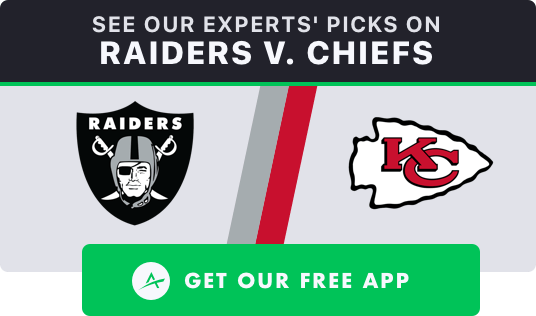 For one, the Chiefs-Raiders game has major playoff implications. With a win, the Chiefs will secure the No. 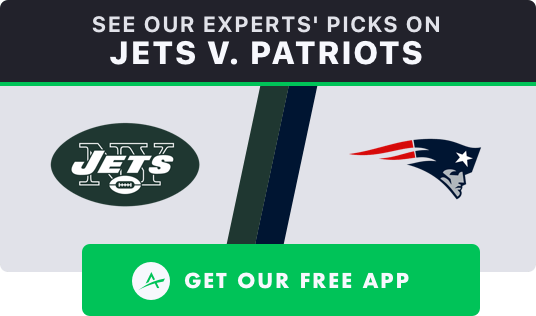 1 seed in the AFC, and quarterback Patrick Mahomes can lock up the MVP award with a solid performance: We should see the Chiefs at their best, and they have a slate-high implied Vegas total of 33.5 points. Additionally, Kelce has personal motivation. With 1,274 yards, he has a real chance to break the single-season tight end receiving record that Rob Gronkowski set in 2011 with 1,327 yards. Kelce is having a historic fantasy season for a tight end, and the Chiefs will look to get him the ball early and often to ensure that he has a real shot to break the record — especially since 49ers tight end George Kittle is close behind him with 1,228 yards. The Chiefs rank first in scoring at 35.3 points per game, and Kelce is a key contributor to their success, ranking top-two among all tight ends with his 141 targets, 98 receptions, 1,274 yards receiving, 1,330 air yards, 522 yards after the catch and 10 touchdowns. Since his All-Pro campaign in 2016, Kelce leads all tight ends with 13.2 FanDuel points per game. He’s also provided outstanding salary-adjusted value with his +3.04 Plus/Minus. Kelce is currently in full-on #ZeusMode, and wide receiver Sammy Watkins (foot) is out, so Kelce could have yet another big performance: Kelce has been nearly unstoppable in the eight games this season in which Watkins has played less than 80% of the offensive snaps. Kelce has a great matchup, which isn’t surprising given the 12-168-2 receiving performance he had against the Raiders in Week 13. The Chiefs have the slate’s most explosive passing-game matchup. On top of that, the Chiefs have the week’s highest pass funnel rating at 88.71. The Raiders rank 31st against the pass with a 27.8% mark in Football Outsiders’ DVOA, and they are dead last against tight ends (44.4% DVOA). 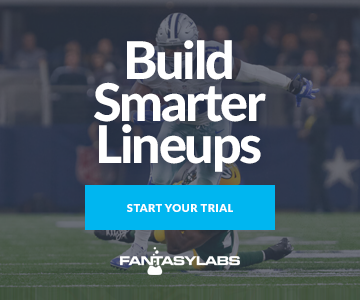 If you roster Kelce in guaranteed prize pools, you might want to use our Lineup Builder to stack him with Mahomes, both of whom are in one of our top stacks of the slate. Since 2014, No. 1 tight ends have had a 0.47 correlation with their quarterbacks, but Kelce has had a 0.78 correlation with his passers. The Raiders have allowed a top-five mark of 12.5 FanDuel points per game to tight ends. One drawback is that the game is in Kansas City. While playing at home is normally advantageous, that’s not necessarily the case for the Chiefs if we’re looking for lots of points. In the Andy Reid era (since 2013), no home team has made under bettors more money than the Chiefs have with their 17-29-1 over/under record, good for a 22.9% return on investment (per Bet Labs). Throughout the Reid era, the Chiefs have scored 2.81 fewer points at home and opponents have scored 6.04 fewer points in Kansas City. Divisional games after Week 10 have a 286-365-15 over/under record since 2006. It’s possible that the Chiefs could score fewer points than expected given the circumstances. Even so, Kelce is extremely unlikely to have a poor game, given his position-high median and ceiling projections in our Models. He truly might break the slate. On Sunday morning I will probably bet the over on Kelce’s touchdown prop. 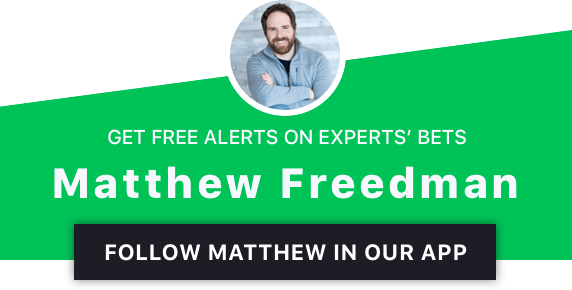 He’s scored seven touchdowns in his eight games without Watkins, and this season the Raiders have allowed tight ends a top-four mark of nine touchdowns, two of which Kelce himself scored in Week 13. Leading the position with 10 Pro Trends, a 99% Bargain Rating and a +3.75 Projected Plus/Minus, Kelce is the No. 1 FanDuel tight end in the Bales, CSURAM88, Levitan, Koerner, Raybon and SportsGeek Models. UPDATE (12/30): Wide receivers Quincy Enunwa (ankle) and Jermaine Kearse (Achilles) are out. There’s a weird quirk in my DraftKings Model — it likes Herndon seemingly every week. Of course, last week he had 20.2 DraftKings points, so maybe the Model knows what it’s doing. 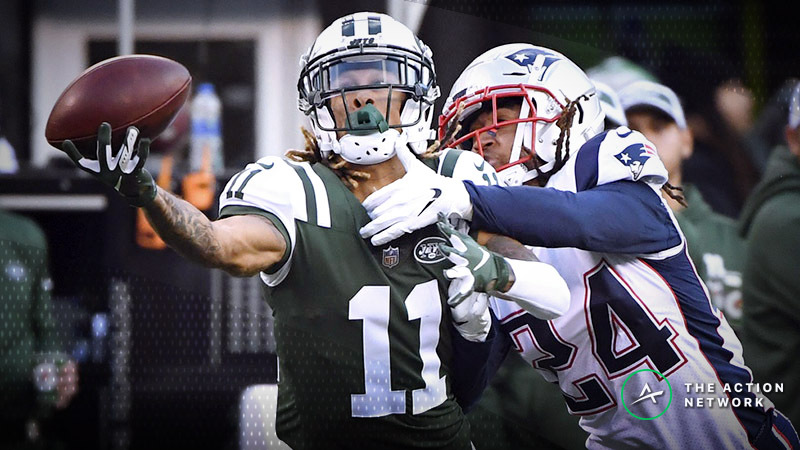 Since Herndon’s Week 6 breakout, he’s top-two on the Jets with 45 targets, 33 receptions, 447 yards receiving, 151 yards after the catch and four touchdowns. Over that span, Herndon has been a relatively strong per-game fantasy producer next to some other, more-hyped players at the position. There’s nothing great about the Herndon’s matchup. In fact, the Patriots are second in the league with a Pro Football Focus coverage grade of 92.6. But Herndon is dirt cheap at $3,400, and the only tight ends with more than his six Pro Trends on DraftKings are Kelce, Kittle and Engram. He leads the position with his 98% DraftKings Bargain Rating. You probably don’t need to pay down at tight end on this slate, but if you’re looking for a tournament punt play, Herndon warrants strong consideration.